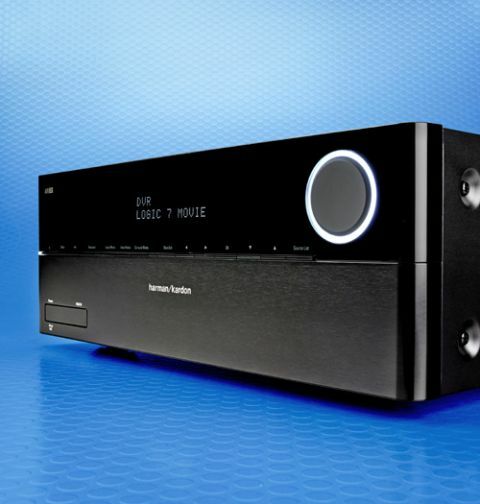 Harman-Kardon AVR 370 review | What Hi-Fi? If you’re after big, loud and brawny surround sound, the Harman Kardon AVR 370 has it in spades. Full of unbridled power and an eagerness to have fun, this seven channel AV receiver with built-in wi-fi is yours for £800. Play Armageddon on Blu-ray and the AVR 370 ploughs through the Aerosmith-filled soundtrack with punch and vigour. Harman Kardon’s characteristically muscular performance works a treat with Michael Bay’s love of ‘thrusters’ and explosions. The crashing meteors, exploding space stations and science-defying asteroid storms roar across the room, each effect landing with powerful impact. There’s enough rumble to the bass to accompany Michael Clarke Duncan’s deep baritone, but it’s a touch unwieldy. Despite the punch and energy, basslines can sound a bit bloated. The lower frequencies need a dash of the Yamaha RX-A1030’s control and the Pioneer SC-LX57’s refined detail for a tauter, more attacking performance. As it stands, the Harman Kardon AVR 370 is a rather relaxed, comfortable listen. While there’s meat and weight to the sound, it’s not as well defined and insightful as price rivals to deliver a riveting, edge-of-seat performance. It lacks the articulate notes of the Denon AVR-X4000, and the subtle dynamics of Pioneer’s SC-LX57. Amidst the eager-to-please and brawny delivery, the AVR 370’s top end can sound a bit coarse and insubstantial. The Harman Kardon's soundfield is decent, if a little densely packed. A clearer, more precise approach to surround steering would give it the thrills and kicks found in the similarly powerful and muscular Yamaha RX-A1030. Also, unlike the half-price Harma Kardon AVR 171 we reviewed earlier in the year, this receiver isn’t as proficient when playing music. While all that energy is still apparent during a song, it’s simply not as well timed or cohesive enough to deliver the rhythmic demands of music. We have to hand it to Harman Kardon for designing an AV receiver that looks so elegant. When you get down to it, it’s still a rectangular black box – but the curved edges and minimalist finish give the AVR 370 a classy look. The glowing light around the volume knob is a nice touch, and the dimmable display is clear and easy to read. The slim, flat buttons on the front panel are near invisible – but it’s here that style overtakes substance somewhat, as they’re rather fiddly to press, especially in the dark. We can’t fault the build quality - the black aluminium finish feels smooth to touch. And, at just 8kg, it’s light too. Compared with some of its heavyweight rivals, the Harman Kardon is almost dainty. Unlike its price rivals, the Harman Kardon AVR 370 offers built-in wi-fi. We prefer the stability of a wired ethernet connection (which is also available), but the wi-fi option makes this amp more flexible, and is handy if your home network is reliable. DLNA 1.5 certification means you can wirelessly stream various popular audio file formats stored on your laptop, computer or NAS device. Elsewhere, songs stored on Apple devices can be played wirelessly via AirPlay, or by plugging the iPod/iPhone/iPad into the front panel USB port. You can also play files stored on a USB flash drive, while the vTuner radio service gives you access to hundreds of radio stations across the globe. There’s a good selection of connections on the Harman Kardon amp. Eight HDMI inputs (one of which is placed on the front panel) and two HDMI outputs all support 4K upscaling and pass-through, as well as Full HD and 3D content. A couple of analogue connections (composite, component and RCA) are placed around the seven pairs of colour-coded speaker terminals. And there are also two optical and one coaxial digital inputs. Running Harman Kardon’s EzSet/EQ system takes a bit of patience and is best done with you outside the home cinema room. It’s worth doing, though, as it calibrates your new receiver to your home cinema set up and the room’s acoustics. The final results weren’t quite spot on, though, and we had to bring out our trusty sound level meter to tweak the speaker settings manually. Harman Kardon supplies two remote controls with the AVR 370: one big, one small. The big one is rather too large, wide in the middle and bulky. The more compact handset feels much nicer to hold, and it provides all the essential buttons in a slim, black frame that feels more like a smart TV remote. There is a third control option: to use the Harman Kardon Remote app for smartphones. Free to download on iOS and Android devices, it’s a minimalist, clean design that offers basic control of the receiver. It’s more useful as a music player, as it lets you create playlists from music stored on your device that you can stream to the receiver. The app is responsive, but isn’t as comprehensive as some rivals. We found ourselves using the small remote more frequently than any other. Whether you’re playing music or movies, the Harman Kardon AVR 370 could do with a touch more refinement and subtlety across its performance. It’s a fun, easy going sound, but it doesn’t deliver the outright excitement and immersion needed to enjoy a film fully. That said, the £800 price tag works in its favour, as does that elegantly designed casework. The Harman Kardon AVR 370 might be outclassed by some more competent rivals, but if its strengths suit, it’s still worth an audition.